Earlier in the month STRUMIS LTD attended the Kaltenbach International Partners in Steel (IPS) event in Lörrach, Germany. This biannual event is hosted by Kaltenbach GmbH & Co. KG and enables steel companies to come together to learn and communicate a range of solutions to the structural steel fabrication industry. STRUMIS LTD exhibited within the event and promoted our STRUMIS fabrication information management system for structural steelwork fabricators and stockholders. The STRUMIS system delivers complete fabrication process control from enquiry, through estimating, contracts, purchasing, sub vendor management, inventory control, production and out into the erection site. With nesting and routing optimization, together with CNC integration and feedback, STRUMIS benefits workflows and processes through fabrication facilities. 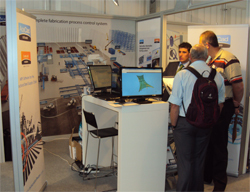 The theme for 2011 was Logistic Process Control and this was emphasised in the STRUMIS LTD presentation, which outlined the advantages of a Fabrication Information Modeling approach integrating all the activities of a structural steelwork fabricator for maximum Logistic, Process and Control benefits. Mr Simon Inman, STRUMIS Product Manager, commented, "The IPS event was very beneficial for STRUMIS LTD and we were able to directly engage with the industry to communicate the benefits of our STRUMIS fabrication information management system". For more details on the STRUMIS system please contact us.